Penny Kendall is a writer with more than 25 years of experience writing in health care and public policy. She has a Bachelor's Degree in English from the University of Texas and a Diploma in nursing from Brackenridge Hospital School of Nursing. Her experience includes advocacy for persons with disabilities. Chest congestion in an infant is not an illness in itself but a sign of underlying illness. 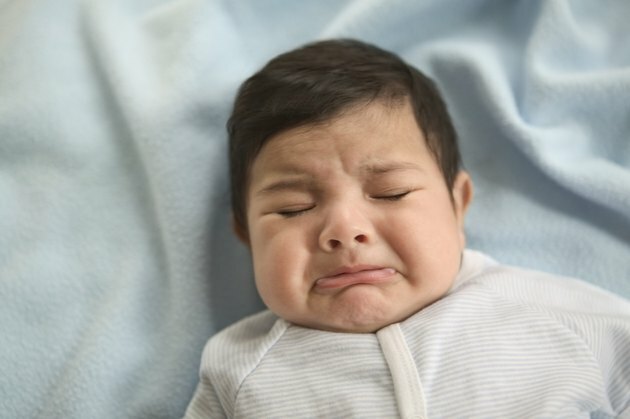 Chest congestion and runny noses are common in infants, because of the immaturity of their immune systems and exposure to other children with respiratory illnesses. Call your physician immediately when an infant less than 3 months old shows signs of a common cold or chest congestion, because these conditions can lead to illnesses such as croup or pneumonia. Mucous from the nose and throat causes chest congestion. An infant with nasal or chest congestion will often quit feeding as frequently because it is hard for her to breathe while nursing. Other symptoms of chest congestion include difficulty sleeping, coughing, running a low-grade fever of around 100.4 degrees Fahrenheit and irritability. If your baby is wheezing, run a hot shower and sit in the steamy bathroom with the baby upright on your shoulder or lap and pat its back gently. This can help break up secretions and ease wheezing. If this does not help your infant or his breathing worsens, go to your nearest hospital emergency room. Call your physician immediately if you notice a decrease in the number of diapers the baby wets; the baby has a temperature over 102 degrees Fahrenheit; he is coughing to the point of vomiting, turning blue or becoming pale; or he has labored breathing with “caving in” of the chest. A bluish discoloration around the mouth, refusal to nurse or take fluids or blood in the mucous also require a call to the doctor. Often, chest congestion and colds must simply run their course. Because most of these illnesses are viral, antibiotics are ineffective and should not be given unless the baby has developed a bacterial overlay with the viral illness.Make your infant more comfortable by offering fluids or nursing more frequently to prevent dehydration; using a vaporizer in the baby’s room to add heat and moisture to the air and thin secretions; raising the head of the baby’s bed to assist drainage from the nose and throat; and using a soft baby aspirating syringe to gently suction the mucous from the baby’s nose. Research indicates that children under the age of 6 should not be given over-the-counter cold or cough medications. These have been shown to be ineffective in children under age 6. They also have potentially significant side effects and adverse reactions.